– there was no concert revenue last year, costing the Bombers about $1 million in comparison to 2011. – the Bombers incurred $1.5 million in “non-recurring” costs associated with stadium delays and a disappointing garage sale of the old stadium furniture. – the on-field product is still terrible, with a pitiful 2 – 8 record after the Banjo Bowl, however ticket sales are way up in the new stadium. WAY up. The bombers are on pace to exceed last year’s sales by an average of over 4 thousand seats per game. This should generate somewhere between $1.5 – $2 million in additional revenue according to my back-of-the-Impark-ticket calculations. – The new stadium is hosting concerts — some biggies too — and that should bring in some big money. – The organization anticipated additional revenue streams in it’s annual report. I don’t know if those included the reported $2.1 million 7-year sponsorship deal with Manitoba Liquor and Lotteries Corp, but that $300k per year will be a very welcome cash infusion, as will the increase (I presume it’s an increase) in cash from the naming rights to the new joint. Add it all up: about $2 million in additional ticket revenue, $1 million in additional concert revenue, $1 million less in non-recurring stadium costs, and maybe an additional $500k from naming rights … that’s a $4.5 million bounce from last year! Add to that additional revenue from concessions and other new revenue streams that the Bombers have forecasted, and the future looks bright. Maybe over $5 million brighter. Transit. This is what got me on this whole train of thought in the first place: the gross underestimation of transit capacity required to haul Bomber fan butts to the game. 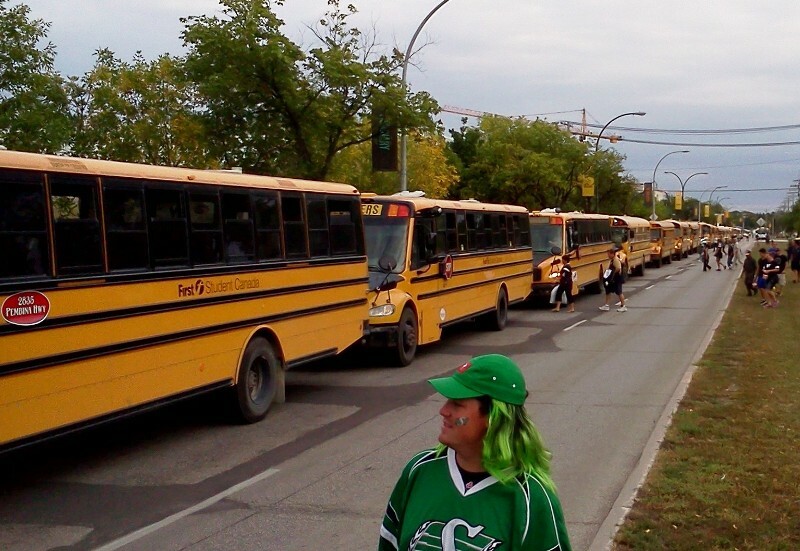 The initial transit plan included only 45 buses to supplement regular transit service – enough to carry about 2500 people to the game. That was woefully inadequate, even based on the Bomber’s own estimation of the number of people who would be taking transit (5000), never mind the 10,000 or so people who are actually taking transit. I did some more back-of-the-hydro-bill calculations based on the nearly 200 buses the Bombers are now employing and the approximate cost per hour of running those buses, and came up with an estimate of $1 million. I was told privately that transit costs are $100k per game, so that squares pretty well with my estimate. That’s only the transit aspect. You can up that by another 50% for other traffic management costs. $1.5 million. This is at least $1 million more than the Bombers had initially anticipated, and certainly far more than they required last year. Manitoba Public Insurance will cushion that blow a little bit, even though they have no business doing so, with a $330,000 3-year transit sponsorship deal. This comes at the same time, of course, that MPI is asking the Public Utilities Board for a 1.8% rate increase, but that’s beside the point here. The point is that the $110,000 per year will not come close to covering the Bombers’ additional transportation costs. Human Resources. Firing people and hiring new people costs money. Apparently the Bombers are still paying the salary of former coach Paul LaPolice, and now you can add former GM Joe Mack to the list. I don’t know how much the resignation of Garth Buchko cost, but unlike you and me, when a President and CEO resigns they typically get a healthy severance cheque. Some of my friends have speculated that the only reason Coach Burke hasn’t been fired already is that the Bombers don’t have the cash flow to replace him. It is plausible. I can’t think of many other reasons why he’s still patrolling the Bomber bench. Stadium woes. A few days ago Bartley Kives wrote about cost overruns related to the new Investors Group stadium. He spoke of an additional $10 million loan (from CIBC) that ‘BBB Stadium Inc.’ had to take for stadium renos, plus “at least another half-million bucks” for other adjustments like fixing the press boxes. Some people are saying that the Bombers have already borrowed an additional $30 million on top of that acknowledged $10 million loan, and the Hamilton Spectator predicts that the stadium costs could eventually reach “closer to a quarter of a billion dollars” from the initial $190 million “guaranteed” price. If the some of the suggestions are correct, the extra amortized capital costs would add more than $1 million to annual burden of the new stadium .. plus the additional financing costs which could be substantial, especially if more bank loans (vs. government loans) are involved. There is one more bit of good news: the CFL signed a new television deal with TSN that could more than double the $2.1 million that the Bombers get from the league each year. Will the financial difficulties be enough to wipe out the revenue windfalls from seat sales, concessions and concerts? Hard to say. Unanticipated stadium costs are really the big wildcard here. My own prediction? There will be a healthy profit from operations, but after interest and amortization the team will be in the red. It will definitely be a challenging time for the Bombers. You know what would help? If Manitoba Hydro signed a multimillion dollar deal to sponsor the lighting at Investors Group Field. They should look into that before they apply to the PUB for their next rate increase. Pretty soon were going to have to create a few more crown corps to sponsor the bombers to try and keep them in the black…..
Will: My first comment on the new blog! That could be a future post some day: crown corps and their advertising and sponsorships. Can you see the Bombers being sold to private interests and eventually making a profit? Thanks for continuing to blog and participate in WIP. I don’t see that happening unless the team went into receivership at some point.. If they were sold the private owners would be saddled with all the debt and obligations that the team is currently burdened with.